I am quite certain there are not many guys alive who do not have a love affair with old cars! 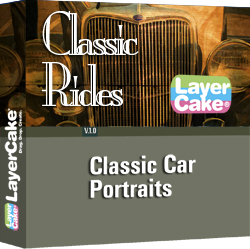 The LayerCake Elements, Classic Rides Collection contains fifty (50) muted and antiqued, high resolution portrait backgrounds which are the perfect choice for the High School senior males seeking a unique senior portrait; not to mention those car clubbers. Each high resolution digital background is able to be cropped to fit any custom size desired. Add the “Buddy Studio Pak” and you’ll have a production studio for creating your own time saving custom templates. The LayerCake Celebration Collection with party hats, balloons, disco balls, streamers and fireworks, is perfect for New Year parties, or any celebratory event! The LayerCake Celebration Collection includes twenty five (25) high resolution digital backgrounds which work with any editing/compositing application which uses layers. Absolutely nothing else like the LayerCake Celebration Collection on the market!